The Local Acts were individual pieces of legislation around England, for example in London, Hampshire, Berkshire, Greater Manchester, Merseyside, etc requiring additional fire safety measures for specific building types over and above those specified in the Building Regulations. While each one was slightly different, one of the common themes was additional firefighting facilities for storage buildings, such as the Ocado warehouse. 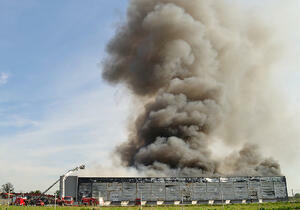 One of the requirements was the installation of sprinklers or smoke vents in storage buildings over 7000 cu. metres and the installation of smoke vents and sprinklers in buildings over 14,000 cu. metres. The justification used by government for repealing the Acts was presented in an impact assessment in 2011 and was loosely presented as an argument over consistency across England and Wales in the requirements for buildings. However, it was more strongly centered around the monetary savings in both the construction of new buildings and also the long term maintenance of both sprinklers and smoke ventilation systems. The saving in capital and maintenance costs for deleting the benefits of the Local Acts for Tall Buildings, Large Storage Buildings and Car Parks was estimated at around £15m over 35 years  – provisions which were ‘not considered necessary to ensure life safety in case of fire’. Grenfell and Ocado alone have cost so much more than this. In our opinion, it would seem the government have chosen to focus on short-term gains. However, as everyone knows, there is no such thing as a free lunch and there is a cost that instead of being picked up in the construction and maintenance of buildings where it can be budgeted and controlled, is being picked up by the owners through lost revenue, customers and shareholder value. Insurers will be assessing whether or not they will pick up the bill - and how will they pass it on to their customers to cover this claim? Indeed, Ocado themselves just recently won a ‘Highly Protected Risk Award’ from FM Global. The world leader in commercial property insurance presented Ocado with the coveted award for the extensive sprinkler system they installed in the Andover facility in 2018. The HPR award states that a building meets the highest possible industry standards for property protection against fire. Clearly, there is a mismatch between what, on paper, appears to be the highest possible industry standards and what the reality is when a fire breaks out. What’s more, it has also been argued that had Section 20 of the London Act, (which was also repealed) still been in force, the Grenfell tragedy could have been avoided. Controls of materials were more stringent and approval of new buildings and refurbishments were under the control of the local Building Control who were also required to consult with London Fire Brigade. At Colt, we believe more can be done to ensure that buildings, businesses and livelihoods are protected. That’s why we’ll be lobbying for a change to reintroduce smoke control as a national requirement for warehouses. What difference could smoke control make? By venting heat from the building, the high level temperatures are reduced – retaining the structural integrity of the steelwork for longer, potentially avoiding building collapse. We still don’t know the nature of the fire spread and what exactly went wrong at Andover, but is the short term gain of omitting the benefit of smoke ventilators and sprinklers from storage buildings through the Repeal of the Local Acts worth it? If the answer to that question is yes - would it still be worth it if people had died? Our specialist teams have been helping business owners design, install and maintain their smoke control systems for over 85 years. Indeed, we helped pioneer it after a spate of large fires in the 1950’s claimed some of the most notable automotive production plants of the time. That’s why so many motor manufacturers now voluntarily insist on installing smoke control systems at their plants in order to safeguard a continuous manufacturing process. Perhaps it is time for the Building Regulations to consider more than just getting people out of the building and to do more to protect property, and importantly fire fighters. If you are at all unsure whether your building’s smoke control and fire safety equipment is outdated, faulty or not equipped to deal with a major blaze, contact our servicing department today for a free building survey.